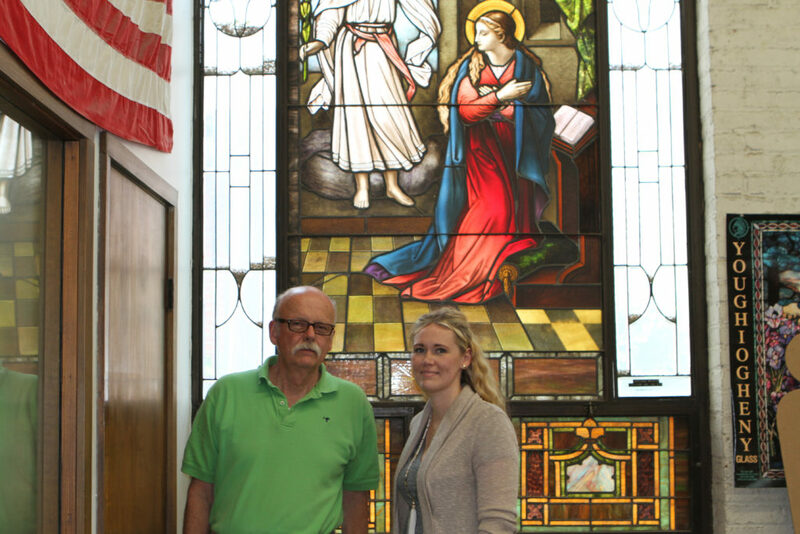 Gary Helf and his daughter, Andrea Helf Reid, continue their family’s stained-glass legacy at Franklin Art Glass Studios in German Village. 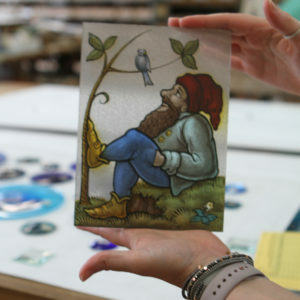 Stained glass has always been a fixture in Andrea Helf Reid’s life. When she was a kid, summers meant traveling to different parts of the country for stained-glass conventions, which would roll into family vacations. Closer to home, she’d help out at the Helf family business, Franklin Art Glass Studios Inc., in German Village — working in the store, cutting pattern pieces for the artists, sweeping the warehouse floors and any other odd job that needed done. 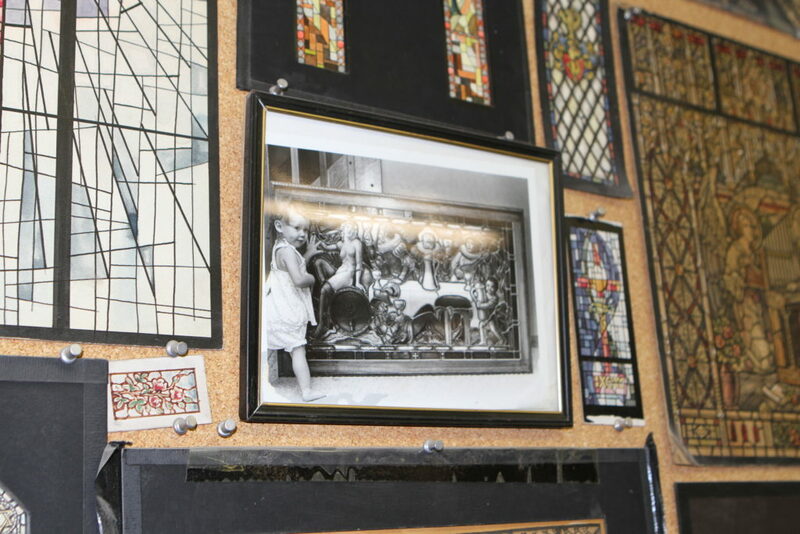 Among the many photos adorning the walls of Franklin Art Glass Studios is one of Andrea Helf Reid as a young girl, next to a stained-glass design. By the time she started college at Wittenberg University in Springfield, Helf Reid knew she wanted to come back to Columbus and work at the family business. Founded in 1924, Franklin Art Glass has a rich local and regional history. And even before Franklin Art Glass, her family was making stained glass in Columbus. With her post-graduation plans in mind, Helf Reid decided to study both business and art. She worked with an advisor from each area of study to create an interdepartmental degree, which was then approved by the provost. “It worked out really well,” she says of her bachelor of arts degree. Since graduating in 2003, Helf Reid has been continuing her family’s legacy at the Sycamore Street studios. While her title is vice president of Franklin Art Glass Studios Inc., she does a little bit of everything, much like when she was younger. Today, her roles include part-time designer, bookkeeper and marketing and social media manager. 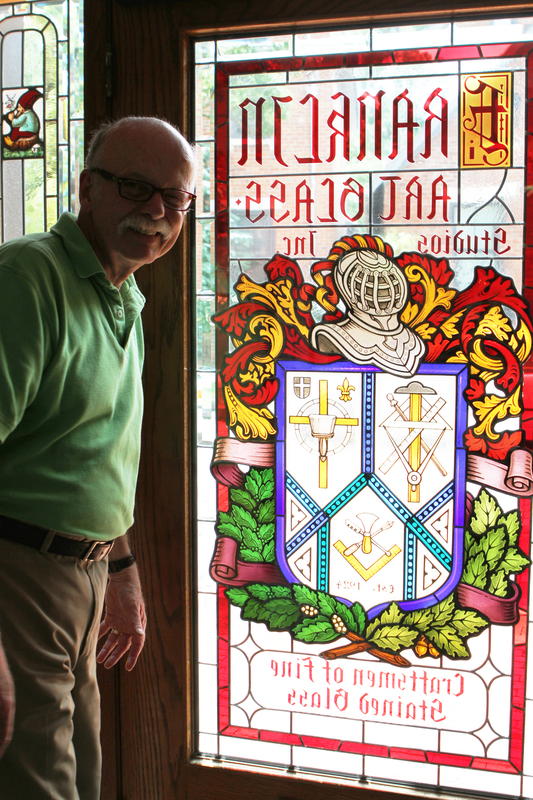 Stained glass goes back five generations in the Helf family. It all started with Henry Helf, who worked as the shop foreman at Von Gerichten Art Glass Co. in Columbus until the company closed in 1931. Henry passed his love of glasswork on to his son Henry “Elmore” Helf, who — along with Wilhelm Kielblock and Wilhelm Kielmeier — founded Franklin Art Glass Studios Inc. on Spring Street downtown in 1924. At the time, the country was on the brink of the Great Depression, which lasted for about a decade, starting in the late 1920s. Henry wasn’t getting work at Von Gerichten, so he filled his time by drawing intricate window designs for Franklin Art Glass. Original drawings by Henry Helf from the 1920s are displayed in a meeting room at Franklin Art Glass Studios. Wilhelm Kielblock was known for his Munich-style “impish” gnome creations. This one was created by Franklin Art Glass’ senior designer, Michael Whapham, who studied under Kielblock. The economic downtown meant little work for the fledgling company, so Kielblock and Kielmeier left Franklin Art Glass. Kielblock was an artist and had little interest in running a business, anyway. But their departure was amicable, and Kielblock even set up shop at Franklin Art Glass Studios, producing glasswork under his own company, Ohio Trade Studio. 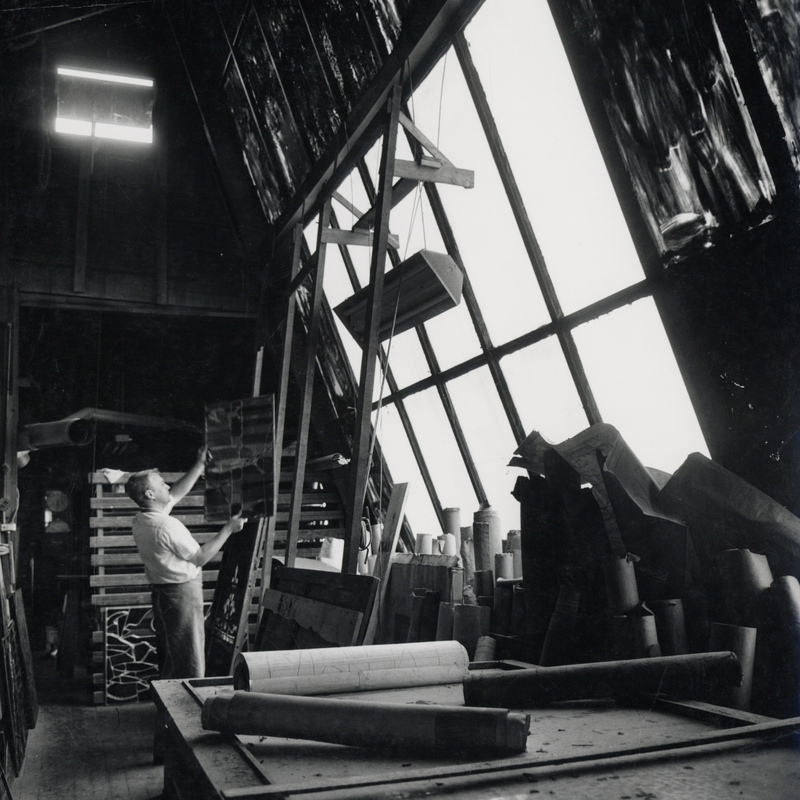 Despite the Depression, Franklin Art Glass survived and, eventually, thrived. When Kielblock and Kielmeier left, there were less people to pay. 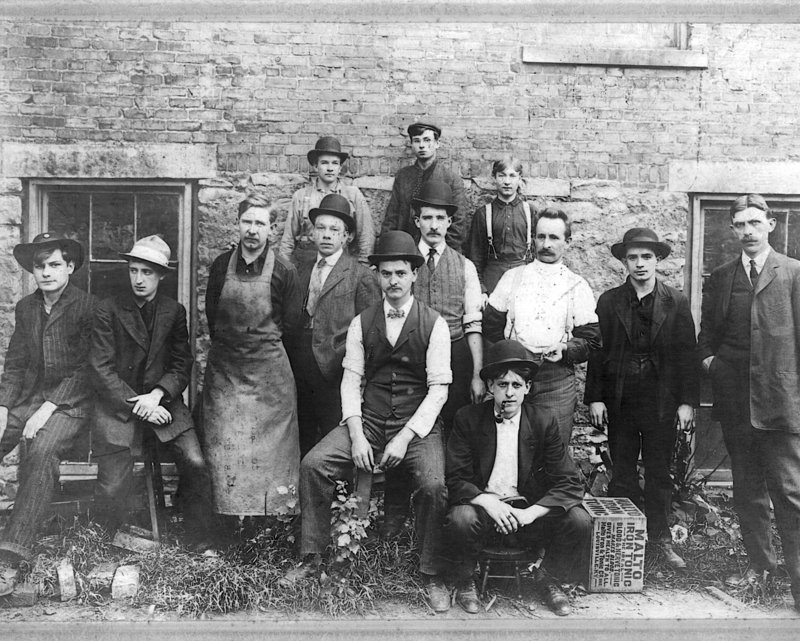 Plus, the Helf family already had established connections in the industry. In 1945, Elmore passed the baton to his son James Helf, who had just come back to Columbus after serving during World War II. James ran the company until passing it on to his son and Reid Helf’s father, Gary Helf, in 1971. Gary had just earned his business administration degree from Eastern Kentucky University. While the installation has changed over the years, Franklin Art Glass has largely maintained the same design process since its inception. Franklin Art Glass created a sign that explains their stained-glass process. “The process is pretty much original. I tell people the big change in the process is we use electric soldering irons,” Gary says, adding that they used gas-powered soldering irons until the late 1960s. “And florescent lighting,” Reid Helf adds with a laugh. The company’s big break came in the ’60s, when Wendy’s was preparing to open their first hamburger shop, just down the street from Franklin Art Glass’ second location on Oak Street. Wendy’s hired Franklin Art Glass to help them design and then create a series of stained-glass, Tiffany-style hanging lamps for the restaurant chain. They also made stained-glass wall dividers for some Wendy’s locations with salad bars. 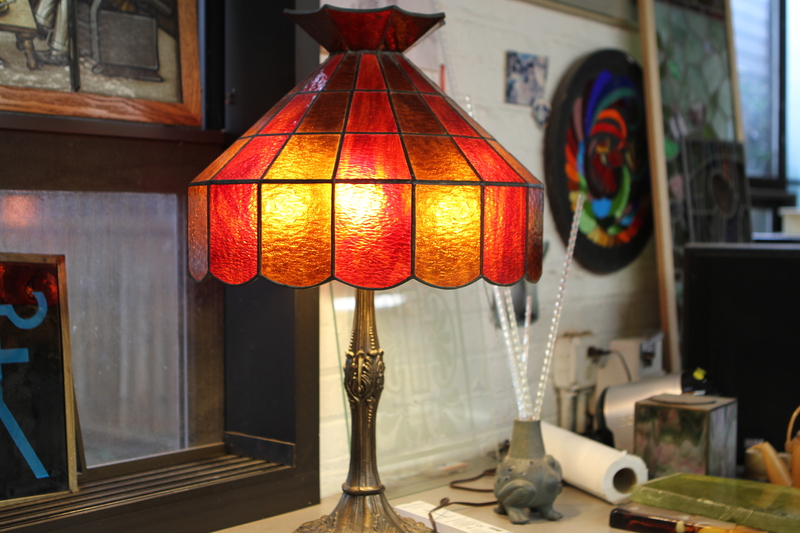 A Tiffany-style Wendy’s lamp lights up the Franklin Art Glass Studios. The project, which lasted about a decade, was so big that Franklin Art Glass added an entire department devoted to Wendy’s. In that time, they produced about 45,000 lampshades that were installed in locations across the country, and even a few overseas. From there, their corporate client list grew to include White Castle, Victoria’s Secret, Max & Erma’s and more. 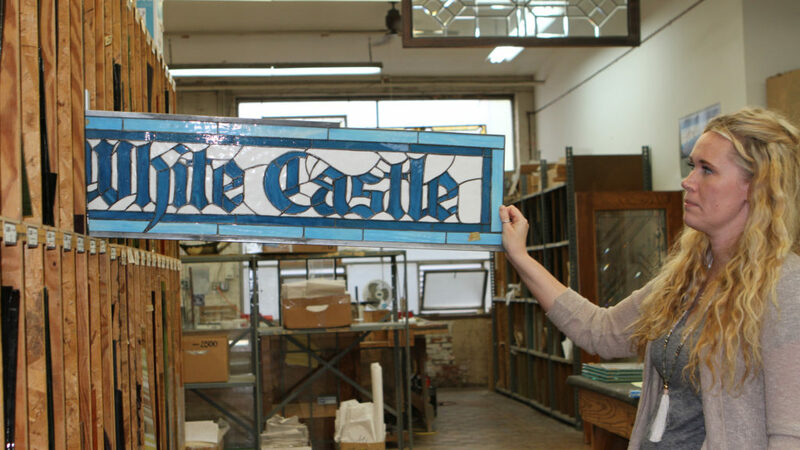 Andrea Helf Reid holds a stained-glass sign made for White Castle. 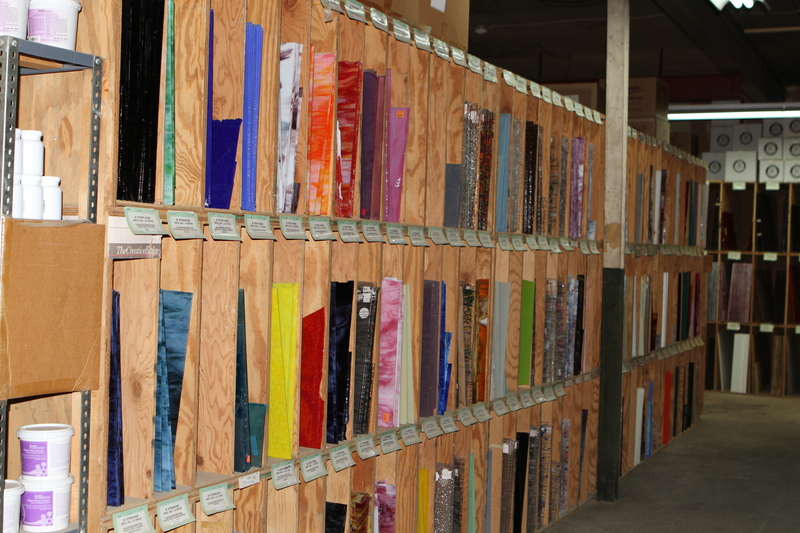 Franklin Art Glass Studios is a German Village hidden gem. Blending in with the surrounding sea of brick on a residential street, the building — which was originally built as an armory and was, at one time, used to store Franklin County’s voting machines — is easy to miss. You may have even parked there without realizing it — The Sycamore restaurant uses Franklin Art Glass’ parking lot for overflow parking after business hours. But Franklin Art Glass has been on Sycamore Street since the company moved from Oak Street in 1968. The business — which includes retail, ecommerce, wholesale, restoration and custom designs — is housed in a 23,000-square-foot plant with a 12,000-square-foot warehouse. With 21 employees, they’re now the largest stained-glass company in the state. 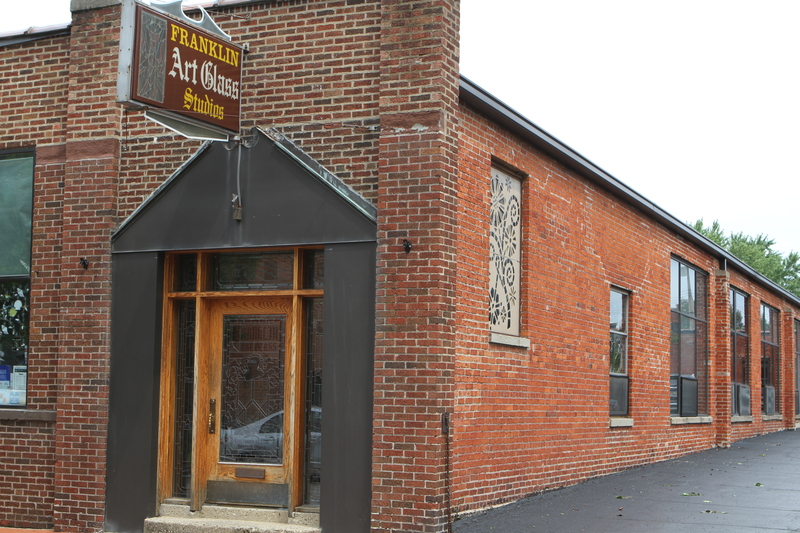 Franklin Art Glass Studios Inc. is located at 222 E. Sycamore St. in German Village. When walking in the front door — which is stained glass, of course — visitors enter a deceivingly small retail store that gives little indication of the expansive size of the facility that’s the length of a city block. 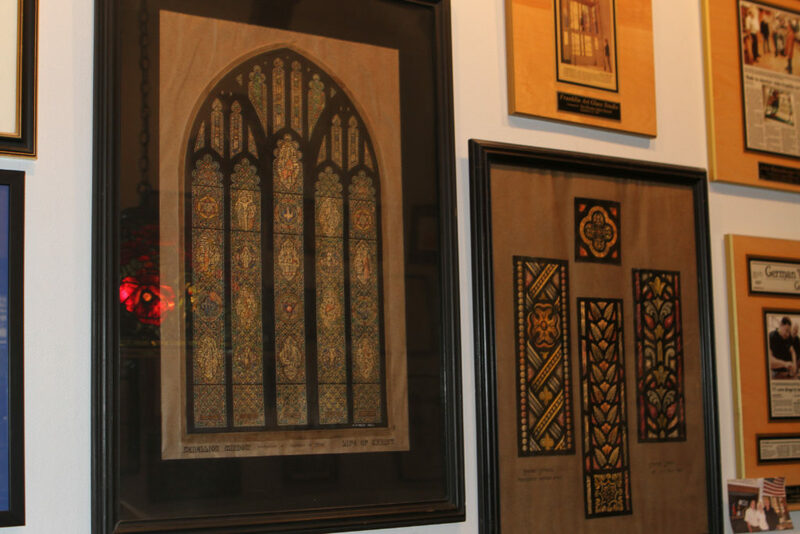 But behind the cozy shop filled with ornamental glassware, like intricate lampshades, and rows of glass samples ranging in color and texture, designers and craftspeople are hard at work on projects, from a single cabinet-door panel to a large stained-glass installation for a church. 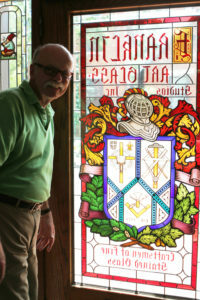 Gary Helf stands next to the front door to Franklin Art Glass Studios, from the inside. Many associate stained glass with religious institutions, and for good reason. “Just about any church in the area we’ve probably done work for,” Helf Reid says. One example is the Tifereth Israel synagogue on Broad Street. But their window artworks range in style from traditional to modern. When New Albany was being built, they received several custom orders to fit the theme of the Georgian-style homes. 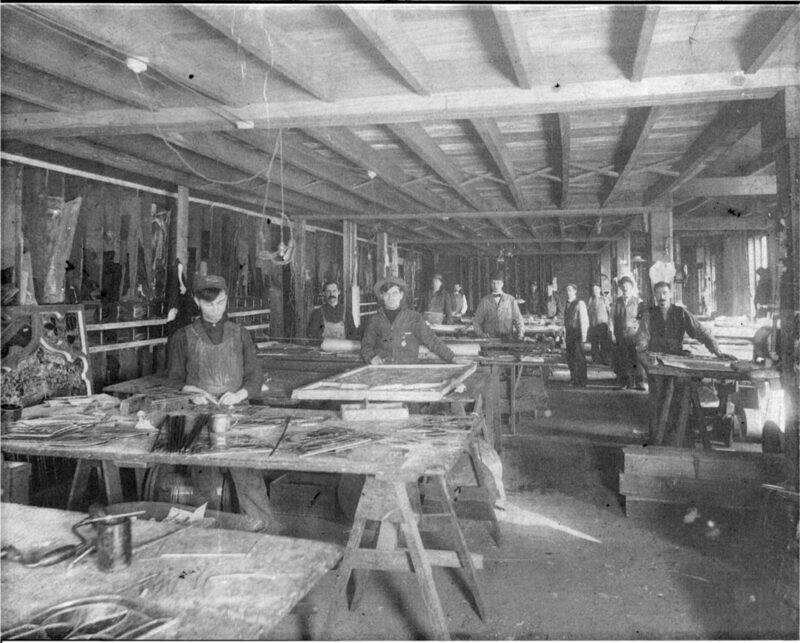 The custom studio also handles the company’s restoration work. Helf Reid says the amount of new versus restoration projects varies, but at the moment, they’re doing more restoration work than custom orders. And to some extent, it’s because of the age of the city of Columbus. 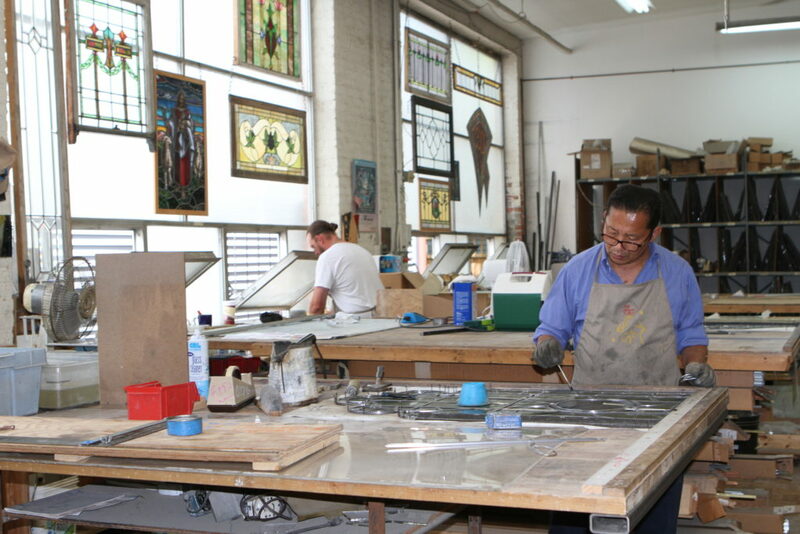 And now, Franklin Art Glass has been around long enough to begin restoring their own work. They’re currently working on an extensive restoration of glasswork the company created and installed in St. John’s Burry’s Church in Rochester, Pennsylvania in 1928. For the Rochester, Pennsylvania, restoration project, they’re sketching the original windows, taking them apart, replacing the lead cane and then reconstructing the windows, using the original glass. On this episode of Columbus Neighborhoods, we’ll meet the Central Ohio creative community, starting with the Pen & Pencil artists club. Learn about famed Columbus artist George Bellows, as well as local artists Carl Dumpke and Malcolm J. Meet Transit Art’s next generation of creators. Then, we’ll visit the Ohio History Connection to view Emerson Burkhart paintings from the 20th century. This entry was posted	on Friday, July 14th, 2017 at 2:45 pm	and is filed under Blog, Story. You can follow any responses to this entry through the RSS 2.0 feed. Both comments and pings are currently closed.